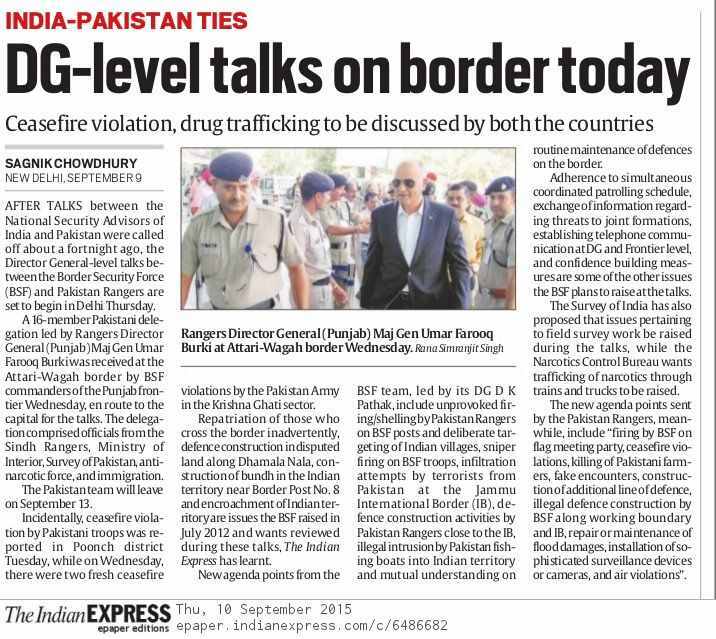 A high-level delegation of Pakistan Rangers, headed by its Director General Umar Farooq Burki, today crossed over to India through Attari-Wagah land route for the crucial four-day meeting with its Indian counterpart Border Security Force (BSF) DG, DK Pathak. The 16-member delegation entered India around 12.30pm and after a brief halt at Khasa headquarters of the BSF, it left for New Delhi, where the talks will take place, from Sri Guru Ram Dass Ji International Airport around 4pm. 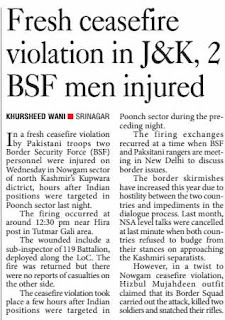 They were welcomed by the BSF IG, Punjab Frontier, Anil Paliwal, at the Zero line. Besides Paliwal, a battery of BSF officials, including BSF DIG (Amritsar) MF Farooqui, was present at the joint check post (JCP). A guard of honour was presented to the visiting DG at the Attari-Wagah JCP. 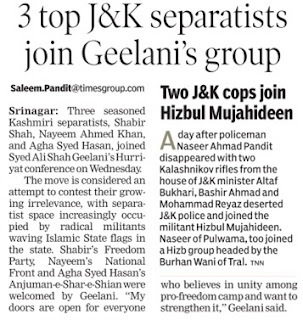 The second meeting since 2013 is being considered very important after the National Security Advisers’ talks between the two nations were cancelled on August 23 over the proposed meeting of separatists with Pakistan NSA Sartaj Aziz that was opposed by India. The last meeting was held in Lahore in December 2013. The 23-member Indian side is expected to raise the issue of unabated ceasefire violations by Pakistan Rangers along the Line of Control in Jammu and Kashmir, which killed many civilians, unprovoked firings and infiltration bids besides other important issues such as smuggling of contraband along the International Border and other border management problems. 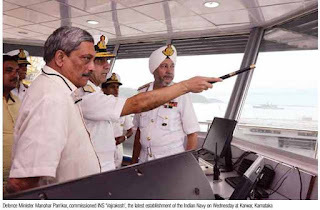 India will suggest enhancing the levels of cooperation between the two forces such as communication between local commanders and coordinated patrolling. 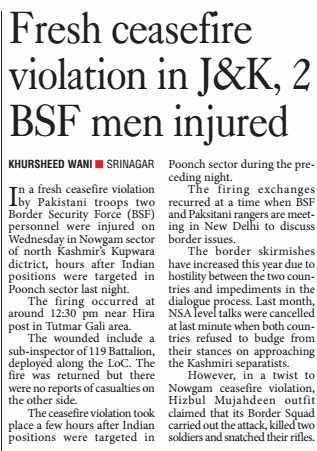 “It depends on Pakistan if they accept our suggestions or not,” said a source in the BSF. 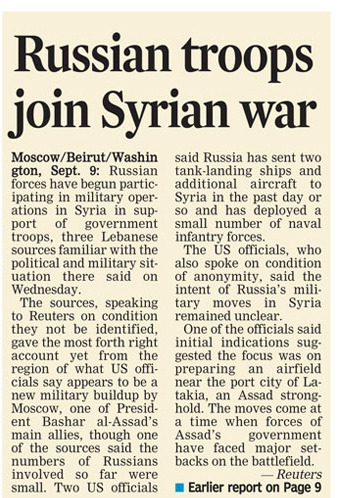 The two forces are likely to finalise the agenda for tomorrow’s meeting either tonight or early tomorrow morning. Mediapersons were not allowed to go beyond custom gates for the high profile visit. 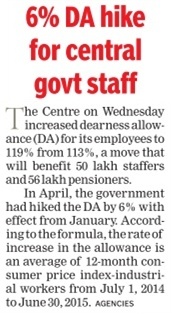 The government today approved a proposal to increase dearness allowance (DA) for its employees by 6 per cent to make it 119 per cent. The decision, which is set to benefit over one crore government employees and pensioners, was taken at a meeting of the Union Cabinet chaired by Prime Minister Narendra Modi. There are about 50 lakh government employees and 56 lakh pensioners. The Union Cabinet also gave its approval for the National Offshore Wind Energy policy and the coal linkage for the Barh power plant of the NTPC in Bihar. Making the announcement after the meeting, Finance Minister Arun Jaitley said the DA hike would take effect from July 1. In April, the government had hiked DA for the staff by 6 per cent (making it 113 per cent of the basic pay) with effect from January. As per the agreed formula, the DA rate increase is an average of 12-month consumer price index for industrial workers from July 1, 2014, to June 30, 2015. The hike is in accordance with the accepted formula based on the recommendations of the Sixth Pay Commission. The combined impact on the exchequer on account of both dearness allowance and dearness relief will be around Rs 6,655.14 crore per annum and Rs 4,436.76 crore in the financial year 2015-16 (for a period of eight months from July 2015 to February 2016). The National Offshore Wind Energy policy would provide the roadmap for development of such plants in the country. NAWAZ SHARIF seems fated to have an adversarial relationship with his army chiefs. He was first elected to office in 1990, heading an army/ISI-backed alliance of Islamist parties. Sharif was soon at loggerheads with his army chief Gen Asif Nawaz, who died in mysterious circumstances. General Asif’s successor, Gen Waheed Kakar, duly sacked Sharif in 1993. In his second term, Nawaz chose to force his soft-spoken and professionally respected army chief Gen Jehangir Karamat to quit. He then superseded several senior generals and appointed a ‘Muhajir’, Pervez Musharraf, to succeed Karamat. Musharraf was joined by Sharif in leading Pakistan to disaster and diplomatic disgrace, following an ignominious defeat, in the Kargil conflict. In the blame game and melodrama that followed, Musharraf overthrew, incarcerated and exiled Sharif. Sharif’s woes with the army and its chiefs continue to haunt him even in his third term. In November 2013, he bypassed and sidelined two senior and highly regarded officers, including Gen Rashad Mehmood, whom he appointed to the largely ceremonial post of chairman of the Joint Chiefs of Staff Committee. He then appointed Gen Raheel Sharif, who had a pretty ordinary service record, as the army chief. Nawaz again erred grievously in his assessment of the new army chief he selected. He ignored the fact that General Sharif had been a long-term crony of his bete noire Pervez Musharraf, against whom he had then initiated criminal charges. General Sharif’s elder brother, who was a highly decorated officer, was killed during the Bangladesh conflict in 1971. He was one of Musharraf’s closest buddies. Raheel Sharif received no end of patronage, to rise to the highest ranks of the army, largely thanks to Musharraf. After becoming the army chief, General Sharif has seriously undermined Nawaz Sharif’s image, credibility and power, both in domestic affairs and in foreign and security policies. He started by sending a word that the army would not tolerate any arrest, or detention, of its former chief, Pervez Musharraf. A terrified Supreme Court and a chastened Nawaz duly complied. This was followed by clear messages to Nawaz that he should not seek closer trade relations with India, or meet Pakistan’s desperate energy needs by getting electricity from India. General Sharif also took charge of the Afghanistan policy and even got the ever-obliging President Ashraf Ghani to call on him at the GHQ in Rawalpindi, during a State visit to Pakistan. Raheel Sharif deals with the Afghan President and others, as though he is a parallel head of government. General Sharif has totally marginalised the Nawaz government, within Pakistan also. The army launched the Zarb-e-Azb operations against the Tehriq-e-Taliban, without the formal government and parliamentary approval. These operations have rendered more than one million Pashtuns homeless and led to cross-border shootouts, across the Durand Line. It was Raheel Sharif who also turned down Saudi requests for assistance in Yemen and got the Pakistan Parliament to rubber stamp what he wanted. The army is now acting like a State within a State in Baluchistan, where it ignores the orders of the Supreme Court to produce “missing” persons it had detained. In Karachi, it has become a law unto itself, by getting the paramilitary Rangers to clamp down on the MQM. It has even launched an anti-corruption drive against the PPP by arresting close Zardari confidant and aide Asim Hussain. Worse still, the dummy defence minister Khawaja Asif and former environment minister Muhammad Ullah openly accused former ISI chiefs Lt-Generals Shuja Pasha and Zaheer-ul Islam of attempting to undermine the Nawaz Sharif government by backing the anti-government agitation by Imran Khan’s Tehriq-e-Insaf Party. Imran Khan’s former deputy, Javed Hashmi, has alleged that the then ISI chief Shuja Nawaz actually told Imran’s supporters in Islamabad to “surround and drag Nawaz Sharif out of his residence”. 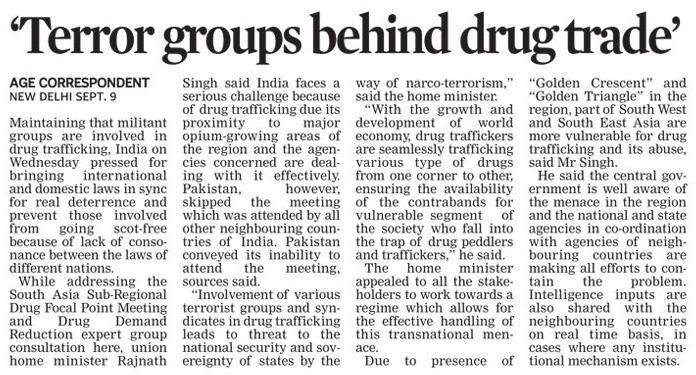 It should have been obvious to New Delhi that the NSA-level talks on terrorism were going to achieve nothing, as the Pakistan NSA has no say on the terror that the Pakistan army unleashes within and beyond Pakistan’s borders. 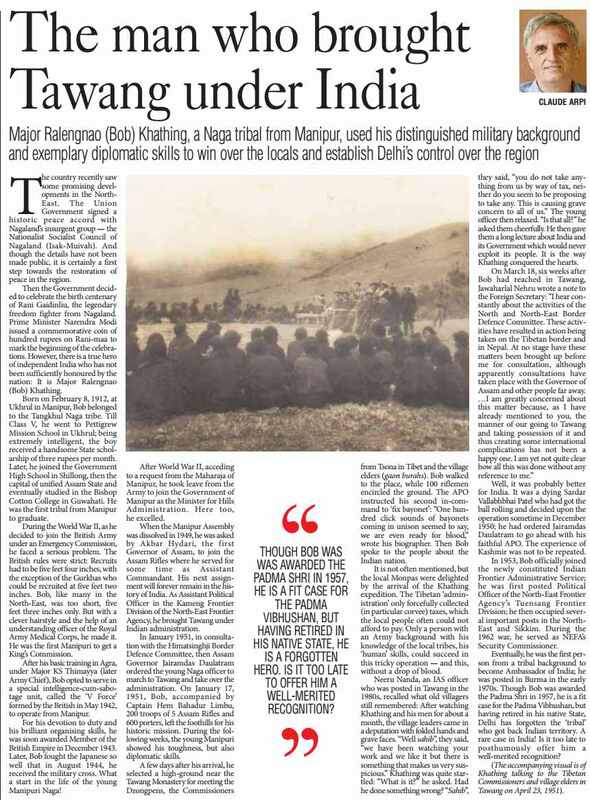 The strategy should, therefore, have been to not yield, either on the agenda of talks or on meetings with the Hurriyat, without giving Pakistan a chance to scuttle the talks and blame New Delhi. 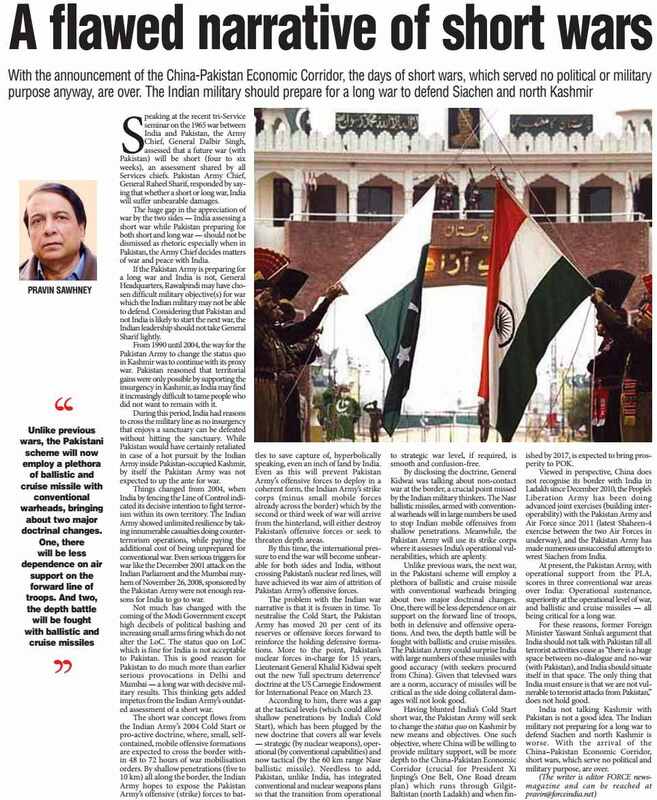 Pakistan’s policy, to which we have wrongly acquiesced to in the past, is to tell the world that the Hurriyat Conference is the sole, authentic representative of the people of J&K and that the elected government in Srinagar is merely an unrepresentative puppet of India. Allowing Pakistan to use visits by its leaders to India to achieve this aim, by their meeting the Hurriyat leadership and not the State’s elected leaders, was a grave folly. The fundamental mistake that New Delhi initially made in dealing with the meeting of NSAs was to seek an agenda from Pakistan, instead of just saying that talks would be held according to the provisions of the Ufa agreement. Sartaj Aziz would obviously have raised the issue of J&K. He could have been told that we would not respond, as the item was not on the Ufa agenda. We could have added that the whole of J&K is an integral part of India, as enunciated in the unanimous parliamentary resolution of 1994. 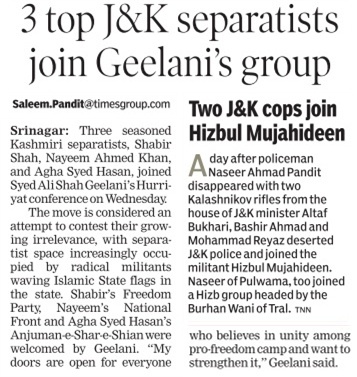 Likewise, after voicing our objections to a meeting of Sartaj Aziz with the Hurriyat, all that needed to be done was to slap detention orders on Hurriyat leaders while they were in Delhi, after the arrival of Sartaj Aziz. He could surely have not called off talks after landing in New Delhi! Nawaz Sharif is today a “lame duck” Prime Minister, incapable of independent decision-making, not just on issues like terrorism, infiltration and J&K, but even on issues like trade, energy, connectivity and economic cooperation. 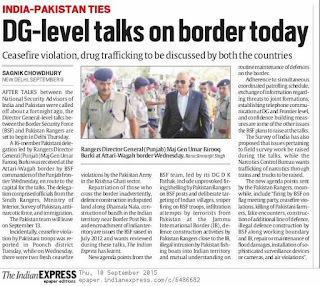 Serious issues like terrorism and cross-border infiltration can be addressed only by the Pakistan army in meetings between DGMOs, at which officials of the Ministry of External Affairs and Intelligence agencies would participate. 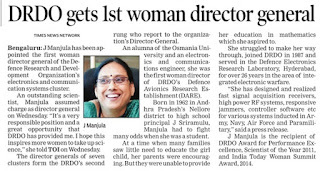 The DGMO meetings should be institutionalised. Gen Raheel Sharif can then be reminded regularly of his mentor Pervez Musharraf’s assurance that “territory under Pakistan’s control” would not be used for “terrorism against India”. In the meantime, New Delhi’s response to infiltration and cross-border terrorism will have to be increasingly robust, as it was prior to the ceasefire in 2003. The much-awaited one rank, one pension (OROP) may not have pleased all but the BJP is hoping to reap major benefits by selling it as the "Prime Minister’s promise fulfilled" in the ongoing "perception match" among parties in the high-stake Bihar polls. 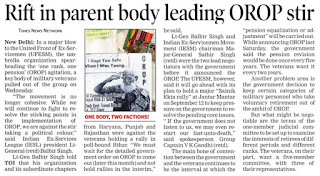 Even as confusion remains on several key points, the BJP will use OROP as a proof of "jo kaha woh kiya" while campaigning in the Bihar polls. According to the party, the OROP announced by the Centre on Saturday will benefit nearly 3 lakh ex-servicemen and 1 lakh war widows in Bihar. “The NDA government''s decision to implement OROP proves that PM Narendra Modi''s assurance in this regard has been well meaning and sincere,” BJP leader MJ Akbar was quoted as saying in Patna. While 3 lakh ex-servicemen and war widows may not constitute a major chunk of the voters'' pie, the BJP hopes the decision will help it prove the key point — the PM kept the promise he made at Rewari in the run-up to the General Election. As per the official photo electoral rolls published in the state on July 31, there were 6.68 crore voters in Bihar, of which 3.56 crore are males. The BJP was under tremendous pressure for an early implementation of the OROP as the party’s ideological mentor — RSS — wanted the pension scheme to be rolled out at the earliest. Sources say the fast-tracking of the OROP was part of the "course correction” given to the Modi government in the BJP-RSS “samanvay baithak” to dispel negative perceptions. Chief Minister Parkash Singh Badal today announced a monthly pension of Rs2,000 for war widows in the state. He also announced free bus travel for them. He said the government had already decided to enhance the monetary compensation for the recipients of Param Vir Chakra from Rs30 lakh to Rs2 crore, Mahavir Chakra from Rs20 lakh to Rs1 crore and for Vir Chakra from Rs15 lakh to Rs50 lakh. Badal also announced to raise the monthly travel allowance of war widows from Rs150 to Rs500. Family members of 1965 war hero Abdul Hameed and the daughter of legendary Lt General Harbaksh Singh were honoured on the occasion. The Chief Minister said the ex gratia in case of battle casualties had been increased from Rs2 lakh to Rs5 lakh; in case of disability of 75 per cent and above from Rs2 lakh to Rs4 lakh and disability of 50 per cent and above from Rs1 lakh to Rs2 lakh. Addressing the gathering, Badal said the paddy growers need not have to worry as every grain would be procured by the government. He said the farmers and soldiers were the backbone of the country and government was working for their welfare. Chief of Western Command of the Army Lieutenant General KJ Singh lauded the state government for organising the event. “The residents of this area had played a great role in winning the war. The soldiers and farmers have always worked in tandem,” he said. Lok Sabha MP Ranjit Singh Brahmpura, Cabinet Minister Bikram Majithia, Janmeja Singh Sekhon and Chunni Lal Bhagat, area MLA Virsa Singh Valtoha and serving and retired officials of the armed forces were present on the occasion. 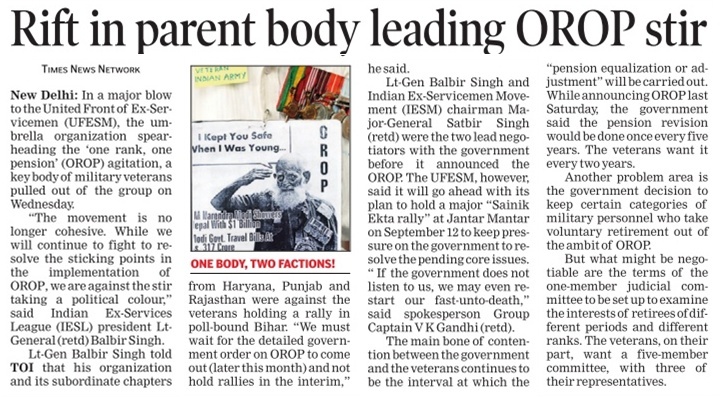 The current lopsided OROP announcement has resulted in the BJP losing goodwill amongst military veterans. Speaking at Faridabad on September 6, Prime Minister Narendra Modi announced that those taking voluntary retirement also will be eligible to OROP. One wonders if he realized that after 15-months of inter-ministerial deliberations, insertion of the VRS clause was anything but bureaucratic mischief. Especially, since VRS does not exist in the military. 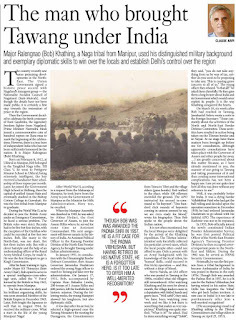 Had VRS existed, perhaps half the military would have gone for it considering the political and bureaucratic apathy that the military has been subjected to over past several decades by all governments. 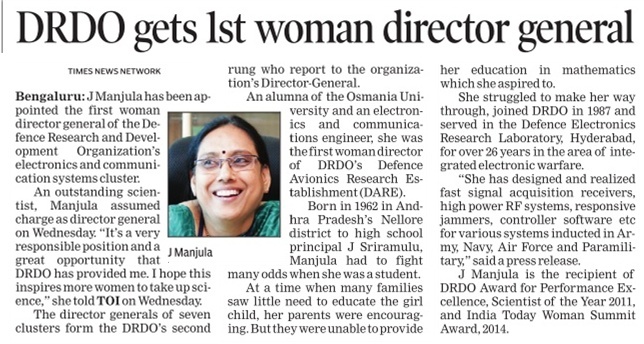 Just the number of personnel from Special Forces who took pre-mature retirement in the last 10-15 years because of such apathy would shock the public. That the number would have been much more but for the cap on how many can leave is a separate issue. While announcing OROP, the Defence Minister, reading from a prepared script though flanked by the Service Chiefs, apparently had little idea about the implications of announcing that personnel taking voluntary retirement would not be eligible to OROP – indeed a sad state of affairs. His body language anyway indicated he had been stumped by the financial pundits. In military, pre-mature retirement can be sought without completing minimum pensionable service or after completing minimum pensionable service. Personnel in the latter category draw pensions and should be entitled to OROP. By just mentioning “early retirement” those drawing pension were being denied OROP, which was not justifiable. Though Prime Minister Modi has clarified OROP will be applicable to all those drawing pension, it is yet to be seen what will be mentioned in the government’s implementation letter, especially since this would likely be issued ‘after’ the Bihar elections. Obviously, the bureaucratic advice that the Prime Minister and Defence Minister receive is wrought with anti-military machinations, otherwise such a clause—VRS in OROP—could not have been inserted in the first place. The Modi government became the laughing stock of the world due to the brutal police action on legally and peacefully protesting veterans at Jantar Mantar on August 14 – an action ill advised. The folly was compounded when no apology was rendered by any political authority. Sending a scapegoat police officer to apologize was a laughable action. There came not a word of remorse from the President (Supreme Commander of Armed Forces) during his Independence Day Eve address to the nation, neither by the PM and the RM on their Independence Day addresses, or not even a tweet from the Prime Minister known for his humility. 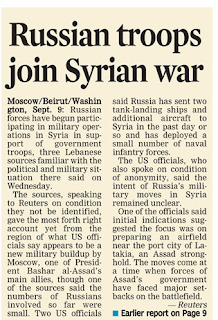 Was it bureaucratic advice to keep the military under the thumb ‘any which way’? With Indo-Japanese relations on a high, the least our hierarchy can learn from the Japanese is humility. The fact remains that the blot of unprecedented police action against the veterans will stick with this government for a very long time. But getting back to OROP, the veterans have simply been demanding OROP as defined by the 2011 Koshyari Parliamentary Committee and the grant of OROP w.e.f 01 Apr 2014, as committed by the UPA government in Parliament on 17 Feb 2014 and by the present NDA government. The Defence Minister in his press briefing announced: cost of OROP would be Rs. 8,000-10,000 crore, increasing in future (recently MoD and Defence Accounts had stated cost of OROP as Rs 8,293 crores); benefit will be w.e.f 1st July 2014; arrears will be paid in four half-yearly installments, single installment for widows; 2013 will be taken as base year; pension will be re-fixed for all retiring in same rank with the same length of service as average of minimum and maximum pension in 2013, those drawing pensions above the average will be protected; personnel who voluntarily retire will not get OROP; pension would be re-fixed every 5-years; a one-man judicial committee to examine interests of retirees of different periods and different ranks and inter-service issues to submit report in six months; and that the PM’s commitment to OROP is fulfilled and MoD will soon issue implementation orders. All those trumpeting that the promise stands fulfilled have obviously not read the Koshyari Committee Report. For had they read it, they would have realized what the military had prior to the 3rd Central Pay Commission (CPC) in 1973. The Committee’s recommendation to restore the pre-1973 status was accepted by both UPA and NDA governments. The pre-1973 status meant that: OROP was applied to military with annual equalization of all military pensions which was not connected to any pay commission, and; in addition, benefits given to other government servants as part of pay commissions were also applied to the military. The 3rd CPC arbitrarily stopped OROP and annual equalization of pensions for the military, reduced military pensions from 70% of pay to 30%, enhanced pensions of other government employees and continued with annual equalization of 100% pension for organizations like the Railways (whose manpower strength is as large as the Indian Army), bureaucracy, judiciary, parliamentarians and civilian defence employees. Isn’t it shocking that 45% of defence pensions outlay is being consumed by 22% of civilian employees of MoD sitting in cushy offices. Can Finance Minister Arun Jaitley justify such protracted injustice to the military veterans? The 5-year equalization of pay defeats the very definition of OROP as every 5-year window would find earlier retirees getting lesser pension from their junior counterparts retiring later. The Modi government had promised to implement the Koshyari Report which included automatic actualization of military pensions. This promise stands broken with the clause of revising pensions every 5-years. The public is being misled by the Finance Ministry saying that “huge sum” will be required to equalize military pensions annually, ‘without’ naming what that sum is. The fact is that annual equalization for four years adds to only about Rs 165.86 crores taking the present OROP cost of Rs 8,293 crores, latter worked out by MoD and Defence Accounts.. There hardly is a problem of money: MoD surrendered Rs 6000 crores on 31st March as also Rs 1000 crores earmarked for the National War Memorial; between 2007-2013, bad debts of government banks amounting to Rs five lakh crore were written off and the RBI revealed that 95% of these were large loans to “big companies”, and; similar bad debts of sick PSUs including Air India were written off, some even inflated for understandable reasons. The latter two apparently are standard procedure by all governments to create slush funds that strictly is black money. Isn’t this deliberate “bureaucratic apathy” which the Koshyari Committee wanted stamped-out, and the government promised to do so as well? Grant of benefits from 1st July 2014 instead of 1st April 2014 demanded by the veterans (commencement of FY 2014-15) is again a typical case of bureaucratic obduracy. Appointment of the One-Member Judicial Committee with a mandate to submit a report in six months appears an effort to take the veterans up the gum tree and dissipate their protests at Jantar Mantar. Why have these issues not been examined by the MoD, DESW, Finance Ministry over past several months? Is the intention to brief him what his recommendations should be? Why does this Committee not consist of a panel (as recommended by veterans) and why it should not have veteran representation unless this is deliberate like lack of service representation in the MoD and DESW. The Defence Minister says government respects armed forces and looks after their welfare but how is it that the 7th CPC has no representation from the military despite such demands from past several years? How is it that IAS, IPS and the Central Services also have Assured Career Progression (ACP) but the military is denied this? The Koshyari Committee described in detail why Armed Forces cannot be equated with any other government service. The government accepted it but permitted underhand bureaucratic machinations. Till recently a DIG was between a Lt Col and a Col. Now a Col has been equated with Non-Functional Selection Grade (NFSG). The rank of a DIG is now officially equal to a Brigadier. Both are now on a Grade Pay of Rs 8900, because of the machinations of the Governmentt and the Central Services to run down the Military. The bottom-line is that the promise of OROP which needed explicit measures to restore the pre-1973 status of military pensions has been thoroughly bungled by the bureaucracy and ostensibly by forces that want to discredit Prime Minister Modi, finances not being a problem as explained above. 5-year equalization of military pensions can no way be termed OROP as persons retiring in the 5-year window will start getting lesser pension than their juniors retiring later. By saying that the next revision will be after five years (in 2019) the bureaucracy has delivered a double blow to the military veterans, which is not being realized. With the 7th CPC delivering its recommendations before 2019, the obvious implications are that benefits given to other government employees as recommended by the 7th CPC will not be passed on to military veterans. It is reiterated that the pre-1973 OROP status included annual equalization of all military pensions (not connected to any pay commission) and benefits given to other government servants as part of pay commissions also applied to the military pensions. It goes without saying that with the current lopsided OROP announcement, the BJP has lost plenty goodwill of military veterans. A half promise kept is no promise. It would be in fitness of things to agree to annual equalization of pensions as promised and appoint a military member in the 7th CPC to ensure the military veterans not lose out, in line with the pre-1973 status. It would also be in the fitness of things for a political figure to meet and address the veterans at Jantar Mantar and express remorse for the police action on August 14. Much that it may perhaps hurt the false ego of the said politician, all these actions will win back veteran support comprehensively. What the government also needs to acknowledge is that over and above the issue of OROP is the crying need to reorganize the higher defence structures including the MoD without which the defence of India will remain in dire straits. The MoD needs to be replaced with a Department of Defence (DoD) headed by the Defence Minister and manned by military professionals. If Prime Minister Narendra Modi could replace the Planning Commission with the Niti Ayog there is no reason he cannot do so for defence – no matter how much the resistance. The entire serving and military veteran community will vote for him if their respect and dues are restored.